When I met with Orem-based all-girl band The Blue Aces at the downtown Coffee Garden for an interview, I never would’ve guessed they’d been awake since 3 a.m. for a performance on the KUTV 2 morning news. 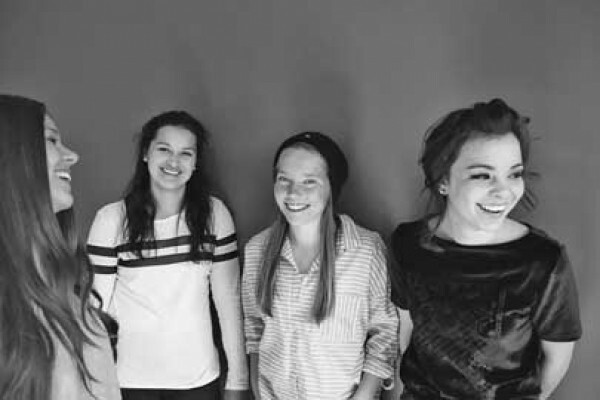 Without a bleary eye in sight, the four young (all are 17 or younger) musicians arrived eager to chat and full of energy—despite the fact that none of them drink coffee, typical of members of the LDS Church. Being born and raised in the faith, the girls have a clean-cut look that does make them stick out a bit—“When we went over to the news station, they were like, ‘It smells so good in here, the other bands smell like beer and cigarettes,’” says bassist McKenna Petty—but when asked if they’d consider themselves a Christian band, they answer with a collective “No!” While other Utah bands might choose to be defined by their religion, The Blue Aces are a band first, and LDS second. The tightly knit trio—Cristal and her sister, drummer Alisa Ramirez, along with Petty—that would become The Blue Aces have been playing together since they were in fifth grade, and officially became a band five years ago. Henderson joined a few years later. Their head-bopping, soulful pop-rock is sweet but sassy, lovelorn but biting, and, of course, family-friendly—like a scrubbed-up version of The Donnas. Cristal’s powerful voice has gorgeously gritty edges, and Henderson—who also handles backup/harmonizing vocals—Alisa and Petty’s instrumentals are catchy and accomplished. Despite their talent, The Blue Aces sometimes do have to deal with people not thinking an all-girl band is worth a second glance. But they’re pros at getting audiences to abandon any preconceived notions, and feel that their lineup “really does work for us more than it hurts us,” Cristal says. Even though they started out playing for spotty crowds at small elementary-school carnivals, The Blue Aces have achieved plenty of noteworthy milestones. They’ve won battles of the bands at Rockfest in Ogden and at Velour Live Music Gallery in Provo and, in 2012, released a self-titled seven-song EP and opened for Neon Trees—now friends of the band and a group the girls look up to as examples of successful Mormon musicians—which “was a chance of a lifetime,” Cristal says. And the band’s appearance on the news that morning—where they performed the brand-new songs “In the City,” “Heartbreaker” and “No More!”—wasn’t even their first. Friday, June 14, 8:45 p.m.